Click to go to New article 1 October 2010. Photos by Jill Quirk added on 21 July. Latest Update 20 July: More Picket News! This will make you angry. In the first project to come under the notorious "Major Transport Facilitation Act," bulldozers move in to nationally significant heritage Westerfield before the Heritage Council Decision comes out. Picket line ongoing, since 5 July. Contacts for the picket site: S Walsh Mobile: 0405 380 312 Also Gillian Collins Pines Protectors 0414 309 960 and Jim Kerin Defenders of the South East Green Wedge Mobile 0409 501 764. Original notice was from Julianne Bell, Secretary, Protectors of Public Lands Victoria Inc.
Update 16 September 2010: Urgent - Reinforcements required now! THE SITUATION AT WESTERFIELD HAS BECOME DESPERATE. After the picket line holding them at bay all winter, the Heritage Exective Director has signed off the plan for destruction. So this Heritage property will be destroyed when they could take the road another route. Help now needed - an hour or two, to front up to the bulldozers which could arrive at any time. "After the terrible meeting yesterday, LMA asked for another with the Welsh's today and broke the news that the Heritage Executive Director has signed off on the revised plan leaving a little more of the dam. The plan they discussed was : 1) the dam would begin to be lowered so the aquatic animals can be rescued, then it would be drained completley. ; 2) at the same time, the fence alignment will be cleared; 3) the construction fence constructed in its new location, and 4) the fauna sweep conducted. Carol Bartley of Southern Way said the nesting boxes will be set up 24 hours ahead of the tree removal so the animals can escape - we were speechless. We believe LMA and Southern Way are in violation of their Incorporation Document, since they are not minimising the damage to Westerfield's. If the Heritage Appeal had not gone through, they would have made no changes at all - they are determined to destroy this magnificent piece of grassy woodland for the sake of the road. We are about to take an action against them. The good news is that the Trades Hall Council and the CFMEU are supporting us, and they believe with us that no work should proceed until such time as all legal avenues have been exhausted. To that end, we need every available supporter to join us on the picket starting tomorrow morning. If you were ever going to help us out - now is the time to do it. Give us an hour or give us a day - we do not know what day they are starting, but we have been notified, and "soon" is any moment from now on. Please distribute this call to action to all your networks. Gillian Collins has led a picket on Westerfield for the last 10 weeks. This has been a deliberate and sustained effort to achieve a better outcome from the Government’s merciless push for Peninsula Link. Peninsula and Western Port need a vastly better, sustainable and greener future than the Brumby government plans for them. Many people have made enormous efforts put their considerable resources into different aspects of the same issue, and the efforts to draw the line at Westerfield are among the most remarkable and admirable. Gillian, the Welsh family, and a couragous and reliable group have picketed seven days a week from early morning until the end of the work day. They have been visited by over 300 individuals and supported by nearly 30 environmental groups across the Peninsula and across Melbourne. Their efforts have not been in vain: It looks like the road easement across Westerfield is still being negotiated, as there has been no clearing of Westerfield. Minister Pallas may be listening. The amazing picketers are giving their utmost, but as in any concerted and long-term action in the face of vested interests in government and corporate enterprise, their numbers need constant supplement. The picket line needs a continuing supply of regular, reliable, individuals. They need tangible support and encouragement - both bodies and funding. The Pines Protectors, a sub-committee of the Frankston North Community Group, Inc., and which Gillian chairs, have organised CMFEU support for the picket and have received help from The Greens Party. 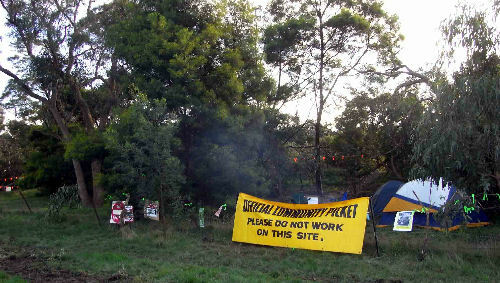 Supporters of the picket have established that the Abigroup construction was started before the legalities were complete and that the Native Vegetation Framework offsets are required before works start (despite information by government). DSE, LMA, LGA Councils and DEWHA must implement the full requirements our environmental laws. Gillian has made a major contribution to the community consultation process supporting the significant efforts of the Frankston community and the two local councils. At a strategy meeting on Friday, the meeting recognised that a picket up to the elections is required. But that needs on-ground support. Conservationists the Peninsula recognise that the 40 year-plan to industrialise greater Melbourne and Western Port poses serious threats, through incremental losses - large and small - on our remaining natural environment. This infrastructure growth is deceptively portrayed by the media and government as a "part of our community’s vision." There needs to be a bolder plan for an environmental and sustainable future. Tangible support to the picket could help this. "...we will probably see the metro rail tunnel funded in the next two or three rounds of federal funding. But as I say, the trucks action plan is quite small; it's only $380 million and the state could fund that from its own resources, really. And then, I think that both the WestLink and the Peninsula Link really ought to be postponed five or10 years into the future." It is still on the web if you want to see it - Google "Stateline" and then click on Friday's program. With a State and Federal election looming, we remain hopeful that this project will be stopped, the land repaired, and more public transport and an upgrade to Moorooduc Highway will be considered. It's not too late. We're looking at a week of cold and cloudy weather - the Melbourne winters I remember from my youth - but we will still be on the picket line. Please come and give us what time you can." UPDATE 16 JULY: PICKET-LINE ONGOING! "Our picket day started with Michelle C. delivering the attached brochure to the Bayside Christian School. Michelle did a brilliant job of capturing the essential environmental values that, we assume, the school teaches. The school had a working bee today, and she delivered the brochure to parents, the Principal, and the "Light FM" radio station that was broadcasting from the school. Later in the day, we had 4 visits from Grade 10 students asking about our picket. This evening I find that David M. from WPPC has sent an e-mail to the school asking that students be allowed to join us - an unplanned but great coincidence. Greg Hunt, our Federal Shadow Environment Minister, paid a visit, and we are hoping for his support for an immediate halt to the destruction and a better solution for all of us, including the school. Peter K. showed us the photo of the skink that he carried home unknowingly yesterday in his tea cup in his backpack. He only found it when he went to clean the cup last night. He called Mel, who told him how to keep the skink comfortable overnight, and he returned it, unharmed, this morning. Such tender care in the face of such a brutal future for this tiny member of our ecosystem. E.O. Wilson, famous ant biologist and author, wrote a book called "Consilience," in which he predicts that there will come a time soon when our individual scientific fields of knowledge will consiliate (jump together) and we will understand the nature of the universe. It feels as though we have a consilience of effort at the picket site, and that we are beginning to really have an effect. We will continue. Hope to see you there some time this week-end." In the first project to come under the notorious "Major Transport Facilitation Act," bulldozers move in to nationally significant heritage Westerfield before the Heritage Council Decision comes out. Picket line ongoing, with effect. Work will probably start tomorrow (6 July) or Wednesday (7 July). UPDATE: REPORT ON TODAY'S ACTION RESULTS BELOW. Contacts for the picket site: S Walsh Mobile: 0405 380 312 Also Gillian Collins Pines Protectors 0414 309 960 and Jim Kerin Defenders of the South East Green Wedge Mobile 0409 501 764. Original notice was from Julianne Bell, Secretary, Protectors of Public Lands Victoria Inc.
Why is this picket-line so important? Expression of public protest on this destructive and undemocratic process is of great importance because this project is the first to come under the "Major Transport Facilitation Act." For this reason it will attract a lot of interest. Another amazing day today, and still no bulldozers. It would seem that Abigroup is now held up until a satisfactory resolution can be found to the outstanding issues about Westerfields. We feel strongly, however. that the picket should be maintained until that happens. think, caused lots of folk to hoot and wave encouragement all day long. Julianne Bell of Protectors of Public Lands drove from the City on Sunday to bring her "Community Picket" sign for us to use, and her brilliant strategic abilities have inspired a lot of what we are doing so successfully now. Another amazing day today. The situation is still incredibly fluid, and picketers hear that tomorrow (7 July) may be the day they try to bring the bulldozers in. A "Community Picket" has been established on both sides of the site, and drivers of the equipment have been asked not cross the line until the unresolved issues with Heritage Victoria and wildlife rescue are resolved. Today representatives from the CFMEU were on the site, thanks to Colin Long, Greens Candidate for South Eastern Metropolitan area. These union reps have been very encouraging about supporting the picket. As many people as possible are needed to man the picket. The picket is situated at Robinsons Road (MEL 103 C11) from 7:00am. Easy parking is at Bayside Christian College, just before the traffic signals that are closing one lane of Robinsons Road for gas line relocation. Walk on up to where the picket is and you will be assisted to get to the rear picket. Frankston City Council, Mornington Council, Protectors of Public Lands, The Greens, Green Wedges Coalition, Animalia Wildlife Shelter, Environment Victoria,The Connies, Western Port Protection Council, Friends of the Pines Flora and Fauna Reserve, Pines Protectors group of the Frankston North Community Group, Inc., Australian Wildlife Protection Council, Inc., Blue Wedges, Friends of Banyule, and the Public Transport Users Group. Mainstream media who have been present or are following are: Channel 7, 9, 10, ABC, The Independent and The Age. Thanks to Peter for the chips, Ronnie for the coffee, Jenny for the tea and home made biscuits, and Joyce and Simon for the egg and bacon sandwiches and afternoon tea! UPDATE 1: REPORT ON FIRST ACTIONS: Monday 5 July 18:24 p.m.
Gillian Collins of Pines Protectors reports that the community picket line was successful, and the bulldozers did not come on the site. They were parked across the street all day, and a lot of their folk stood around idle. Volunteers showed up, brought signs and soup and chips, and generally kept the protestors feeling really positive all day. Gillian writes that great thanks are due to the Mayor, Christine Richards, who stayed all morning and gave lots of interviews to the press. Similarly, she writes that thanks are also due to Neale Burgess, Member of Parliament for Hastings, David Morris, Member for Mornington, and Geoff Shaw, candidate for the seat of Frankston, who all stayed a long time and gave the picketers their support. She adds that the picket starts again tomorrow starting at 7:00am sharp. There will be two locations, the one on Robinsons Road and on the west side of the property, where the bulldozers are now parked. (MEL 103 C11) If you can come, please come to the Robinson's road site and we'll send half of you to the other side. Bring a torch is you're really early, because it was very dark without street lights. Dress warmly, too! There was strong mainstream media interest - Channel 7, 9, 10, and ABC were there, plus a reporter from the Independent. Because this project is the first to come under the "Major Transport Facilitation Act" it is getting a lot of interest and is also very important. More people to support the picket line will be very welcome. 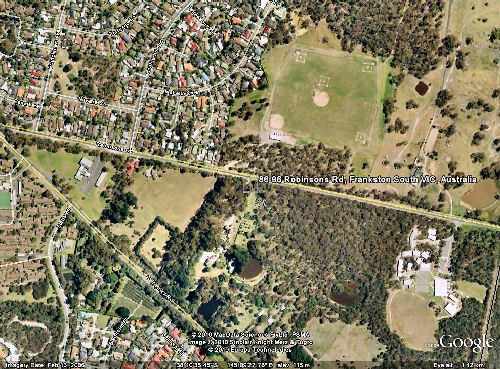 Today: 7 am Monday 5 July 2010 construction will start on the Westerfield bushland heritage property. It is being bulldozed for the peninsula Link freeway route. Local groups will be picketing the site. * The Westerfield appeal was heard in the Heritage Council on 25 June 2010 and no cldecision has been made. The Heritage Council was reported to have said that the members would not be hurried into making a decision. * There still appears to be a dispute over the question of whether vegetation offsets has been finalised. On Monday 28 2010 June a resolution was put to Frankston Council and carried unanimously that "That Council seeks the assurance of the Linking Melbourne Authority and the Department of Environment and Sustainability that Vegetation Offsets required of the Peninsula Link project and the location and detail of such offsets will be determined prior to further clearing occurring. 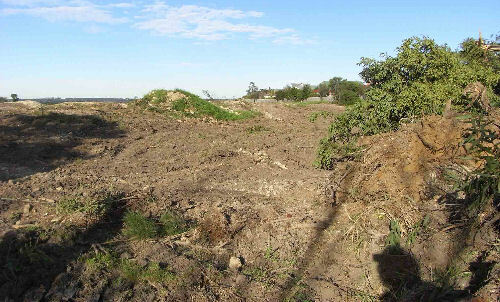 That such offsets for Frankston native vegetation will be taken up within the municipality in consultation with Council to ensure that there will be a net gain of native vegetation within the municipality." The Frankston Council is again considering the matter at a Council meeting tomorrow night. * The owners were given less than 24 hours notice of the start of land clearing/construction and have not been given a time table for works . Time: 7 am start but it may well continue during the morning. blocked it is suggested that you approach via Robinsons Road and drive into the Westerfield property to park. The driveway is opposite Robinsons Park and is just past a white water tower. It will be signposted. Then you will have to walk down to the end of the road. Note that the proposed route of the freeway is marked on the Melways map. Designed in 1924 for Russell and Mabel Grimwade by Harold Desbrowe Annear, Westerfield is the most intact example of the series of houses Annear remodelled, or designed on the Mornington Peninsula in the 1920s which demonstrate the vitality of early twentieth century eclecticism. Moving away from the more formal urban Georgian style, Annear responds to the "playground" ambience of the peninsula with a range of formal attitudes. Westerfield itself is a Y plan half timbered house built on a granite base somewhat reminiscent of French country architecture. However, the significance of Westerfield lies not only with its architecture but also its owners and its place in a particular Melbourne culture of the 20th century. Conceived as a working farm as well as a retreat, Westerfield's grounds are planted with the euclypt species Grimwade cultivated and recorded in a photographic study. With his friend Charles Lane-Poole, first Principal of the School of Forestry at Canberra, Grimwade was ahead of his time in matters of conservation and land use, seeking a workable alliance with industry. During the war, the property was given over to growing crops for medicinal drugs; poppies, lavender, foxglove and belladonna. The house, garden and grounds are included in the classification of Westerfield which is considered to be of national significance. The above article was based on a notice from Julianne Bell, Secretary, Protectors of Public Lands Victoria Inc. Peak oil- why invest in future white elephants? concerned about this uncertainty but our government is unaware of the serious threat of reduced oil supplies prior to 2025. Oil shortages and global warming will increase the number of the world's hungry by reducing the area of land and the amount of fertiliser and pesticides available for farming in developing countries. While there are many events that could postpone an oil peak to after the year 2020, there are equally many events that could lead to an oil peak before the year 2020.....an oil peak in the near future is indeed plausible and that it would be useful to consider the possible consequences for global energy markets and the resulting drive for system innovations. Australia in few years will have a high level of import dependence and remote geographic location, but does not have an oil security stock holding above that which is commercially optimal. The Zero Carbon Australia 2020 Project (ZCA2020) presents a realistic path forward for Australia to achieve a zero-emissions economy, covering stationary energy, transport, industrial processes, buildings, land use and replacement of coal exports. Why is our Brumby investing public money in large, petrol guzzling freeways in light of peak oil? Why does Greenpeace have Bronwyn Pike on its board? What the hell is Bronwyn Pike doing on the board of Greenpeace? And what is Greenpeace doing for the environment? How can anyone concerned about the environment give money to Greenpeace when it has politicians like Bronwyn Pike on its board? "Last month Pike reminded us that "since my time as a board member of Greenpeace, I've been committed to taking real actions to improve the environment. I know that reducing our impact on the environment means not only rethinking how we do things in the future, but what we can change now." Pike is an influential member of cabinet. So what is the government doing for the environment? In June - at about the same time as the latest spruiking letter was being sent to constituents - the government was doing its best to push Planning Scheme Amendment VC67 through Parliament. If it is passed, it will take 46,600 hectares out of the green wedge land for urban development, create reservations for a new outer-metro ring road and the E6 freeway and, in clause 12, change the planning laws to allow construction of high-rise development along existing tram and bus routes." It is for this kind of reason that I cannot understand why people have any faith in the 'classical' environment groups. The Australian Conservation Foundation had for a long time Mr Pratt of Visy as a major donor. That sealed the organisation's fate for me as a paid-for lapdog. If you look at the presences on boards of well-known charities as well, you will find big developers and financiers, even though they are agents of the very problems that the charities pretend to be solving. Last month Pike reminded us that "since my time as a board member of Greenpeace, I've been committed to taking real actions to improve the environment". If she is spruiking the Brumby government's "green" crudentials, then she is totally off the track, and so is Greenpeace. The Brumby government is totally environmentally naive and destructive. They freely give permits to "cull" wildlife, heavily support the land developers and investment industries, and are intent on logging and the polluting desalination plant. The north-south pipeline destroyed bushland and threatened the Goulburn river. They are a "business as usual" party, totally oblivious to the environment and climate change. Population growth is totally incompatible with conservation and is our planet's greatest threatening process. I've just come back from the community picket at the above location. I had a good look around the area to be bulldozed and saw parts that have already been destroyed. This will be a terrible loss to Melbourne when is goes. It is full of birds, bats, frogs and I imagine up until now must have been a wonderful sanctuary. As I walked through the bushland, I saw trees marked with an "H" meaning that they were habitat trees which I understand means that they are treated with some sort of deference and may even be moved to another location. But the whole place is habitat, not just the trees in which where animals or birds rest by day or night ! It was a profoundly sad experience to see this area for the first time, see and hear the many birds, to see a possums' drey above me in a tree where a mother lives with her baby and to know that it is about to be destroyed.